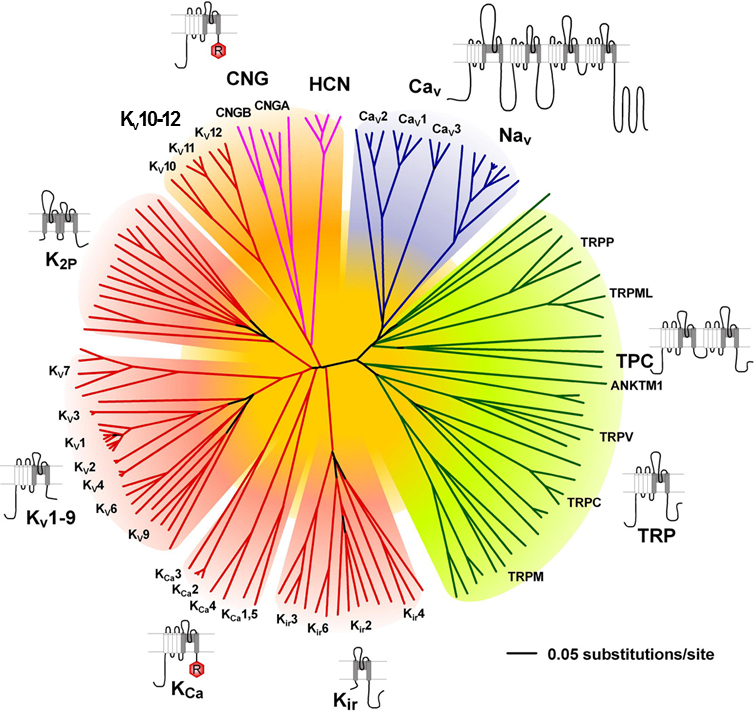 The voltage-gated ion channels and their structural relatives comprise a superfamily encoded by at least 143 genes in the human genome and are therefore one of the largest superfamilies of signal transduction proteins, following the G protein-coupled receptors and the protein kinases in number. In addition to their prominence in signal transduction, these ion channels are also among the most common drug targets. As for other large protein superfamilies, understanding the molecular relationships among family members, developing a unified, rational nomenclature for the ion channel families and subfamilies, and assigning physiological functions and pharmacological significance to each family member has been an important challenge. Voltage-gated ion channels. Accessed on 20/04/2019. IUPHAR/BPS Guide to PHARMACOLOGY, http://www.guidetopharmacology.org/GRAC/FamilyDisplayForward?familyId=696.